After a long pause (Maybe summer break?) Strongbad (Internet cartoon character) is back and kicking. At the rate of one per week, there have been two new sbemails, #174 mini-golf and #175 concert. Following the same pattern, #176 should be released any minute now. Choose one or go to the sbemail menu. 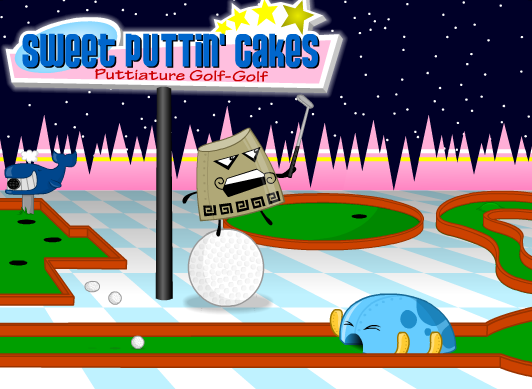 Screenshots viciously stolen from Homestarwiki. The first video is the original video recorded by tvt, where the demo plays on an analogue oscilloscope. The second one is my Reaktor oscilloscope. For those of you who are into Reaktor there are two things that you might be curious about. The first thing is what the wires to the sound output are and why they are there. Well, appearently, Reaktor refuses to unless evaluate the value from the sound input unless there are wires that also leads the events to a sound output. (This probably has to do with saving CPU cycles) I also put a multiplier that multiplies by zero to silence the sound, while still letting audio events through. The other thing is the two things inside the structure that I move the cursor over. These are simply inverters. Because of my sound card (Or the way Reaktor plots data) the image got flipped both horizontally and vertically, and the inverters flip the image so the text in becomes readable. 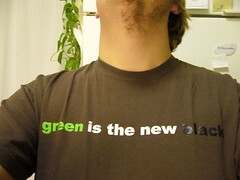 Green is the new black is the new green? 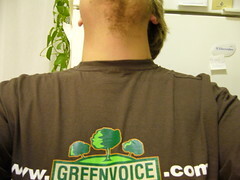 I recently received a t-shirt from Greenvoice, courtesy of Andrew Nesbitt, as a thank you for testing out the site. The left image is the back of the shirt, but I had to wear the shirt the wrong way around to be able to take the shot. They decided to put the brand on the back of the shirt. 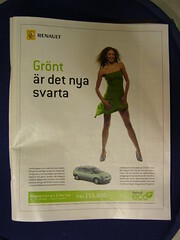 That’s a total nono from a marketing point of view! People pay more attention to the message on the front of a shirt, as that’s usually the side of a person you’re looking it when communicating with her. The back can also be covered with for example a jacket, or as in my case, a backpack. From the designer’s point of view I can understand the decision, kind of, but I still think it would’ve been a good idea to at least print the URL in the front. Black text on brown fabric! Of course the word black should be in black for best effect, but the color of the fabric should be adjusted accordingly. 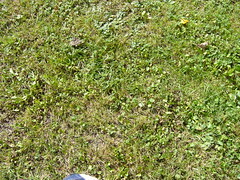 I was at my grandpa’s, picking apples. Here are two shots from when and sat down for some rest. 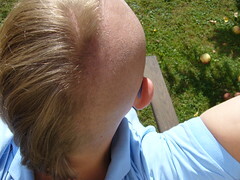 One totally useless lawn shot, and on shot from above my head to see how wll I managed to cut my half hairstyle. 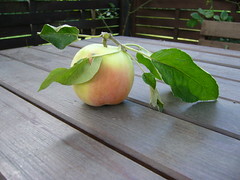 Here’s an apple I picked, and shot on the garden table. An ok shot, isn’t it? 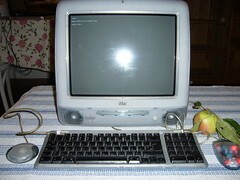 Then what I believe to be the same apple next to another Apple, an iMac that I found in the trash. The OS is Debian (Etch) if anyone wonders. And to the other question, no, it didn’t have Linux installed when I found it, but Mac OS 9. But what truly love about the place is the fantastic wall art! 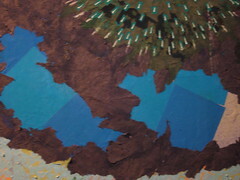 At first it might look like a painting, but in fact it consists of torn, round stickers and small pieces of papier marché. To me it seems to be made in a true Zen fashion. Every piece must be put in the exact right spot, and it must’ve taken a lot of perseverance to get them all in place. 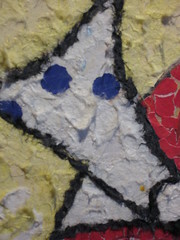 Likewise, the material is bound to age and degrade over time, also true to the Zen mentality. So, a question to my readers. I want to know whether there is a symbolism in the theme? Does anyone know the artist who made the mosaic? These are my theories: It’s clearly related to the sea. 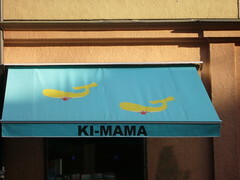 (What else to expect in a sushi bar?) 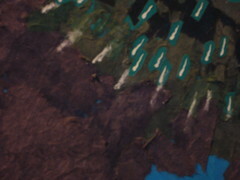 The thing to the right is possibly a fireworks explosion, but probably a hot spring. I have a little theory that it could be a blow from the whale’s blowhole that has somehow been displaced. 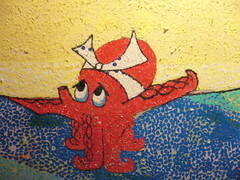 The two main objects in the picture are the whale and the octopus. 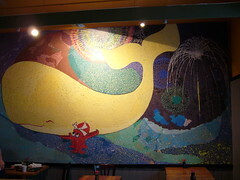 The octopus is carrying the whale, and as can be seen on the lower left close-up, he’s carrying the whale with one sucker on the viewer’s side of the whale. So does anyone know a deeper meaning, or can see any cultural Japanese references that I’m unaware of? I can’t say I didn’t hesitate, but after a while I felt I had to see what the fuzz is about. So now I’ve joined Facebook. I tried to be careful about only adding people who would recognize me, and I didn’t turn on “spam mode”. I will not preach about what’s so good with FB. (Frankly, I’m not even sure myself yet) If you’re in it, fine, otherwise, fine too. However, I decided to give it a serious, and today I also created a group, the Gameboy Musicians group. If you’re on Facebook, and you’re a Gameboy musician, join it, whynot? Until next time, good bye and have a nice day! Download my music from TuneSquare! It’s still in a beta phase, so they money exchange system is not active yet, so I don’t know how that part works yet. However, there’s a competition going on where the most popular artist will win some money and a cell phone. Help me do that dy downloading the music of nitro2k01 from TuneSquare. Please support me by downloading my music from that link. I will also release some previously unavailable material on that site only. This page was previously hosted on http://gameboygenius.8bitcollective.com/wordpress/2007/08/ (*).